Bike maintenance tips, bike maintenance, bikes maintenance - Hero Motocorp Ltd.
Engine oil is a key determinant for efficient motorcycle performance and increased engine life. 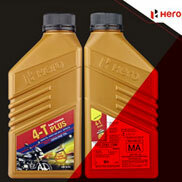 Hero 4-T Plus Genuine Engine Oil is a premium quality engine oil, engineered to meet the lubrication requirements of Hero Engines. Hero 4-T Plus conforms to International specifications of SAE 10 W 30 SJ grade specifications. We strongly recommend that you use Hero 4-T plus to maintain optimum engine performance during extreme driving conditions. How to check the engine oil level? In order to check the level of the engine oil, the vehicle should be on main stand. Check the engine oil level using the dipstick. 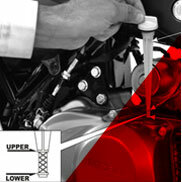 The engine oil level should be maintained between the upper and the lower level marks of the dipstick. In case it is needed, top up the engine oil up to the upper level on the dipstick. Your motorcycle battery needs periodical maintenance to ensure a long and trouble free life. Do the following checks at regular intervals for a reliable battery performance. Check the electrolyte level against the top and bottom markings on the battery shell. Always top up with distilled water whenever required. Check for any leakage from battery. It should be clean and free from any leakages. In case of non use of motorcycle, battery should be kept fully charged and electrolyte level should be at Top mark. Investors Financials Financial Highlights Corporate Governance Stock Performance Notifications Have a Question? Copyright Hero MotoCorp Ltd. 2019. All Rights Reserved. Copyright Hero MotoCorp Ltd 2015. All Rights Reserved.